Every 15th of May the annual Aoi Matsuri takes place in Kyoto. 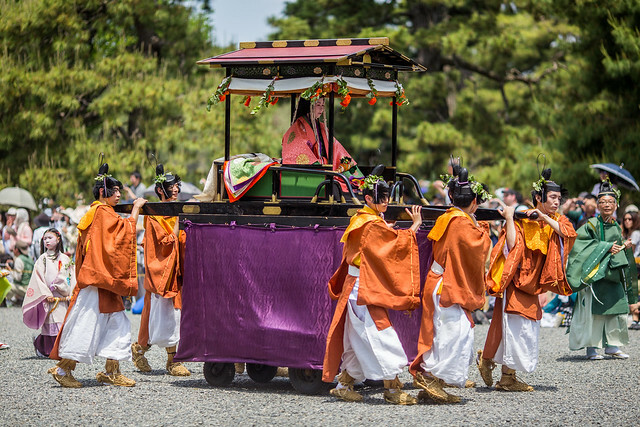 Being one of the three big festivals of the city, visitors should not miss this opportunity when the procession starts at the Imperial Palace and moves on to the two northern Shrines (Kamigamo and Shimogamo Shrine) where the messenger of the emperor appeases the Kamo deities for a good harvest. Part of the ancient procession are two oxcarts, four cows, 36 horses and 600 people, all dressed in the traditional Heian clothing. You probably will spot a lot of hollyhock leaves, from which the festival got its name, that decorate almost everything and symbolizes protection against natural disasters.